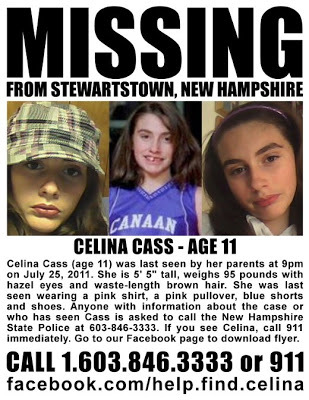 Celina Cass, the missing 11-year-old from New Hampshire, has been found dead. The female body found Monday in the Connecticut River has been identified as Cass, according to a state prosecutor. New Hampshire Attorney General Jane Young confirmed that the identity of the body found at 10:30 a.m. today near the hydroelectric dam near Stewartstown, a quarter of a mile from Cass’ home, at a news conference Monday night. “Based on what we have seen visually, we are treating the death as suspicious,” Young told reporters. No suspects have been named. Young said a criminal investigation is underway. Cass was last seen alive last Monday in front of her computer in her room. An autopsy is scheduled for Tuesday. Earlier Monday, Cass’ stepfather, Wendell Noyes was rushed to the hospital for odd behavior. He has been previously diagnosed with schizophrenia. On Sunday, Celina’s biological father Adam Laro reached out to the public for the first time pleading for her safe return. “Whenever you’re ready to come home Celina, daddy will be here waiting for you,” he said. Over 100 investigators federal, state, and local law officials were involved in the search for the 11-year-old. 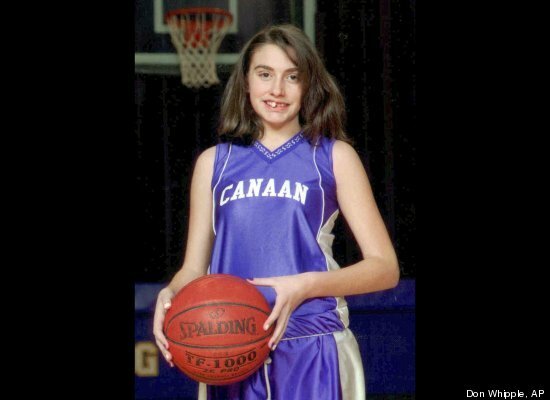 CONCORD, N.H. — A man who lived in the same apartment as a missing 11-year-old girl who was later found dead in the Connecticut River is in custody on charges unrelated to her killing. Kevin Mullaney has been held at the Coos County jail since Jan. 10, a jail official said. The 23-year-old Mullaney is charged with receiving stolen property, breach of bail, possession of a firearm by a felon and forgery. He also has drug possession charges pending in Grafton County. Mullaney was sharing an apartment with Celina Cass and her family when Celina disappeared July 25. Her body was found a week later near a hydroelectric dam that spans the Connecticut River between Celina’s hometown, Stewartstown, and Canaan, Vt., ending an intense search that at its peak involved more than 100 federal, state and local law enforcement officers. Celina’s death has been declared a homicide, but no arrests have been made. Young wouldn’t comment on Mullaney’s recent arrests or any connection to the investigation into Celina’s death. Mullaney has said Celina’s mother, Louisia Cass, was like a mother to him, and Celina was like a sister. Coos County House of Correction Superintendent Craig Hamelin said Mullaney was being held in lieu of a $31,000 cash bond and is expected to be there awhile. He said Mullaney has no court appearances scheduled yet. Mullaney is the son of a former boyfriend of Celina’s mother. He was living with Celina, Louisia Cass, Louisia Cass’ husband, Wendell Noyes, and Celina’s 13-year-old sister, Kayla. Since the discovery of Celina’s body, Louisia Cass has separated from her husband of a year, Wendell Noyes, who has a history of psychological problems. Noyes, 48, was diagnosed with paranoid schizophrenia and was committed to a state psychiatric hospital in 2003 after breaking into the home of an ex-girlfriend and threatening to harm her. He has been in and out of hospitals since Celina disappeared. Friends say Louisia and her daughter are now living with Kevin Mullaney’s father, Mark Mullaney. Kevin Mullaney had been living with them until recently. Mullaney is charged with forging Louisia Cass’ signature on a $250 check he cashed Oct. 4 at Towle’s Mini Mart in Stewartstown. Store owner Shannon Towle said Friday one of her clerks cashed the check. She said she was not aware of Mullaney’s arrest until several of the investigators in Celina’s case came in and had the check with them. It was not immediately known whether Mullaney has a lawyer yet. A phone listing for his father couldn’t be found.